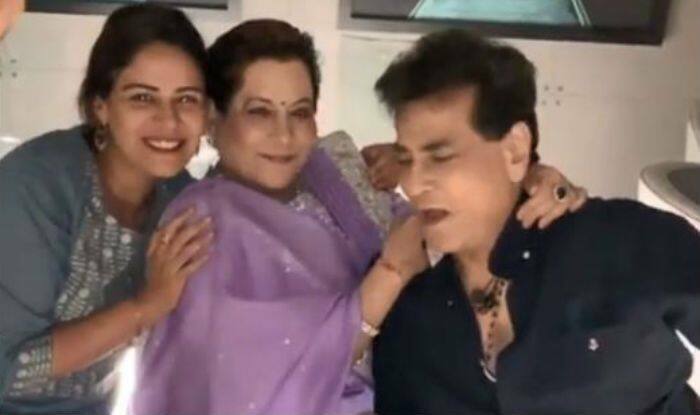 Yesteryear Bollywood actor Jeetendra turns 77-year-old today, i.e. April 7, 2019. The legend gave us blockbusters and cult classics like Magin, Hatim Tai, Tohfa, Jaani Dushman, Maa, Arpan and Dharam Veer. Jeetendra is a successful and award-winning actor-producer of Hindi cinema. His wife Shobha Kapoor and daughter Ekta Kapoor are successful TV and film producers of Balaji Telefilms, Balaji Motion Pictures and ALT Entertainment of which he is Chairman. Recently, the Kapoor family celebrated Jeetendra’s birthday by throwing a party at their home. Television celebrities such as Krystle D’Souza, Anita Hassanandani, Mona Singh and Mushtaq Sheikh were amongst the few who joined the birthday bash of the superstar. There were several videos from the birthday bash which went viral. In of the clips, Jeetendra, Shobha Kapoor and Ekta can be seen dancing. In another video, TV actor Mona Singh can be seen enjoying the celebration as she danced with the birthday boy. Jeetendra was last seen in Mahabharat Aur Barbareek in 2013 as himself (Guest). He has achieved many awards like Lions Gold Awards: Most Evergreen Romantic Hero, Zee Cine Award for Lifetime Achievement, Dadasaheb Phalke Academy Award and Filmfare Lifetime Achievement Award.